Material: 90% Wool and 10% acrylic,there is no wild animal fur added, it is wildlife protection. Size Measurement: 11 Inch in diameter when lying flat. contemporary fashion.Further more,it conveniently match any outfit in your wardrobe in winter,fall/spring. 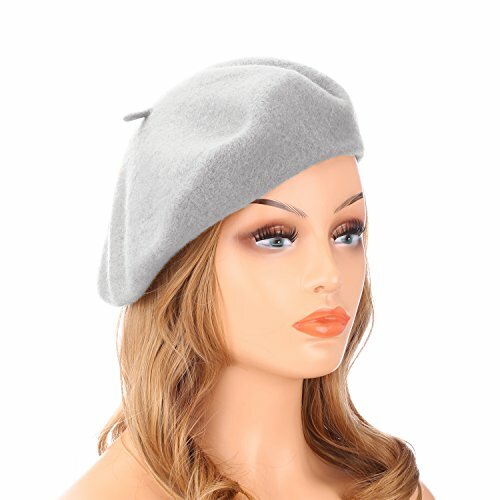 Easy to Wash: The Beret cap can be hand washed when needed.Just soaking the hat in warm water with mild soap and clear it gently.We suggest not to wash it too frequenty. Wheebo Aim: We focuse on high-quality products,and offer best service to our customers. Please be reminded that the color of the actual item might be slightly different from the picture due to the lighting effect,camera brightness and lightness in the field,ect. And yet,please contact us with email if you are not satisfied with our product. We will solve your problem out within 24 hours. If you have any questions about this product by Wheebo, contact us by completing and submitting the form below. If you are looking for a specif part number, please include it with your message.